Ron Suskind's "Confidence Man" raises the question: were women kept from Obama's inner circle? Were Women Kept from Obama’s Inner Circle? 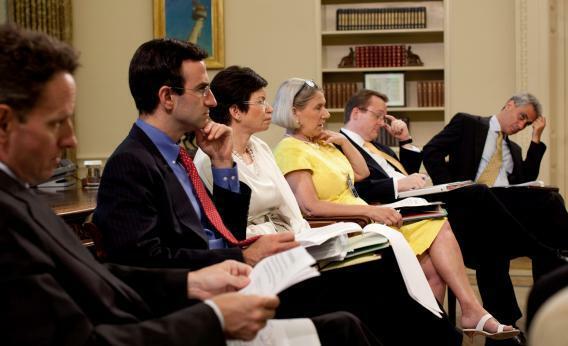 Ron Suskind’s buzzy new book, Confidence Men: Wall Street, Washington, and the Education of a President, contends that women in the early days of Obama’s White House felt left out of important conversations and meetings. According to the Washington Post, the boys’ club of former chief of staff Rahm Emmanuel, former chairman of the National Economic Council Larry Summers and Treasury Secretary Tim Geithner marginalized female staffers like former White House communications director Anita Dunn and former head of the Council of Economic Advisers Christina Romer. Suskind quotes Dunn saying: “This place would be in court for a hostile workplace. … Because it actually fit all of the classic legal requirements for a genuinely hostile workplace to women.” Ouch. [Obama] presides over a White House rife with fist-bumping young men who call each other “dude” and testosterone-brimming personalities like Rahm Emanuel, the often-profane chief of staff; Lawrence Summers, the brash economic adviser; and Robert Gibbs, the press secretary, who habitually speaks in sports metaphors. … While the senior adviser Valerie Jarrett is undeniably one of the president’s closest White House confidantes, some women inside or close to the administration complain that Mr. Obama’s female advisers are not as visible as their male colleagues or, they suspect, as influential. The Dunn of 2009 doth protest too much, but she does have a point–that sort of casual bonding can matter in terms of getting ahead. For her part, Dunn is claiming that Suskind took her quotes out of context. And by all accounts, Jarrett remains one of Obama’s closest confidantes. Still, I bet Obama’s not calling many women to join him in a pick-up game.